I don’t usually re-blog about restaurants, but anyone will tell you that the original Regina’s and their outposts are not equivalent. Steve and I strolled over to the Thatcher St. location around 4:45pm on Saturday, a lovely fall afternoon. There was only one couple ahead of us in line. It was a good plan to go early because by 5:30pm, the line was already halfway down the block. 5 minutes later, we snagged two seats at the bar, with an excellent view into the kitchen and the famous brick oven. 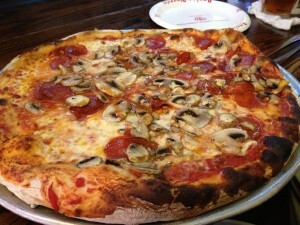 There’s a ton of topping options, but we went with a classic pepperoni and mushroom combination, well done. The pizza was delicious, as expected, but I didn’t feel it was that different from the Medford location, which we frequent. But, the bartender urged me to try the garlic oil and brought over a small container of minced garlic and chili flakes submerged in red tinted oil. I drizzled a little on my pizza, making sure to get some of the garlic on the slice as well. Wow. It was potent and outstanding. This is what you want to have the Vampire Apocalypse comes; this is not what you want to have if you plan to converse with anyone within a 3 foot radius. Bad breath be damned, I slathered it on my next slice as well. We didn’t finish the large pizza, and the bartender kindly packed up our leftovers with more garlic oil. We left and walked straight to the corner store to in desperate search of gum for me.